Eventually the morning came with the bustle of a shift change. What a relief to feel like I was not alone.I knew that I couldn’t move a thing. Steve woke up and straight away, I was looking to him for answers. I’m sure he could see the fear in my eyes. He was stroking my hand and I was just staring at him – my eyes begging him to make this all go away. He burst in to tears. I can remember so clearly him saying, “I’m so sorry this has happened to you”. I was now trying to scream. My jaw was locked tight and my words were pretty unrecognizable. I was yelling, “Is this it? Tell me this isn’t it”. I yelled it over and over again – I was in a panic. I’m not sure if Steve understood what I was saying, but he kept telling me that I would recover. He then walked away for a few minutes to gather his thoughts and I was alone and petrified. Steve and I quickly worked out a way to communicate. One blink for yes, 2 for no. I started trying to spell words by blinking through the letters of the alphabet. Steve realised this would be too tiring for me and suggested he go through the alphabet and I blink on the appropriate letter. It was an incredibly laborious way to ‘talk’, but for now it was all I had. Over the first few days, we refined our technique. The alphabet was divided into 3 categories: vowels, letters before L and letters after L. Steve would list the 3 categories and I would blink on the category I wanted. Then he would run through the letters in that category and I’d blink on the letter I wanted. This did 2 things: let Steve know that I was cognitively intact, and allowed me to communicate ensuring I was never truly isolated. Mum and Dad caught the 5am flight from Brisbane (they were unable to get on a flight the night before). Steve went out to the waiting room to meet them. As soon as he saw them he burst into tears. He had been alone all night watching me deteriorate and feeling like he had to stay strong for me. The moral support gave him the opportunity to let his feelings out. The sight of Steve in tears shocked my parents who immediately assumed I was dead. At this stage, I didn’t want to see anyone. I was ashamed of the state I was. I was young and strong and much more comfortable with the role of carer than patient. I knew how hard they would both take it, particularly Mum. Steve convinced me seeing them was the right thing to do. Little did I know my condition had deteriorated over night and it was expected that I would die. I was so nervous as Mum and Dad walked in. Dad hung back – what do you say to your daughter in that state? ‘Hi honey, how are you?’ just didn’t seem quite right. He didn’t know what to do. Steve explained to them that I could understand everything but I was unable to communicate or move at all. Mum hugged and kissed me and told me she loved me. She then stood back and encouraged Dad to come to me. He was reluctant but did. Steve asked me if I would see the kids. I said no, not realizing quite how unstable my condition was. I didn’t want the kids to see me like that. I thought I’d be much better in a few days and see them then. An ICU consultant saw me early. He wanted me to have another MRI. I was still traumatized from the MRI the night before and flatly refused. Steve explained to me that the doctors really needed to study the clots and make a decision about whether or not to transfer me to Sydney by helicopter where doctors would attempt to clear them. Steve was basically begging me, so of course I quickly changed my mind. So off I went to MRI again, this time accompanied by a full team of ICU staff. This was the first time I truly appreciated the state I was in. They were moving me around and I was realizing the impact of having no control over any muscle in my body. What an uncomfortable and traumatic experience. I was bundled into the machine, covered this time in monitors, in case I tried dying on the job. No stop alarm this time, I was incapable of pressing it. The twitching had stopped which made it slightly easier than the scan the night before. After the scan it was decided not to fly me to Sydney. Sean, the ICU consultant, wanted to attempt an angiogram and thrombectomy in Canberra, in hope of clearing the blockage as soon as possible. I was now struggling to maintain my airway. It was decided to sedate me and intubate me before the procedure. The procedure carried risks such as bleeding so Steve insisted I see the kids. If I had died, I would have preferred them to remember me the way I was before the stroke, but those around me convinced me I should see them. I can’t remember much of the kids visit. I was so nervous about seeing them – I didn’t want them to see me so weak and vulnerable. They huddled together about a metre away from my bedside. They all looked so frightened. I wanted to comfort them – hug them, tell them I loved them, and that everything would be all right. 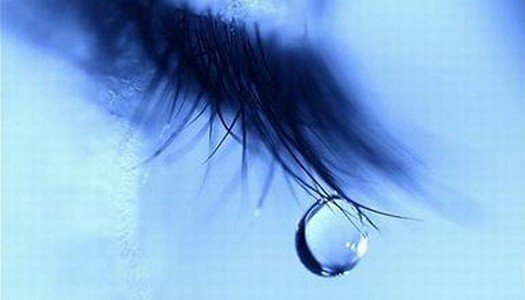 To see my kids scared and in pain, and powerless to do anything, broke my heart. I started crying uncontrollably – I hadn’t wanted to cry in front of them. I was making a horrible sound as I breathed. I sounded like a sick animal dying in the forrest. Fraser still remembers that noise as the scariest thing during the whole ordeal. So off for the procedure I went. A small catheter was inserted into a blood vessel in my groin and slowly threaded up to the arteries in my neck. A small wire was then threaded through the catheter to remove the clot. I dissected or tore my right vertebral artery. 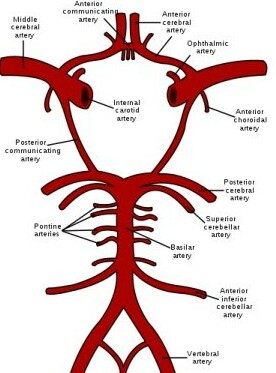 If you look at the diagram below, you will see that the 2 vertebral arteries join up and become the basilar artery. My clot had filled the right vertebral artery, up into the basilar artery, and back down into the left vertebral artery. The basilar artery supplies blood to the brain stem. If the brain stem is deprived of Oxygen because of a lack of blood flow, then a brain stem stroke occurs. The brain stem is very important in regulating many of the body’s involuntary, vital functions such as breathing, heart rate and consciousness. Brain stem strokes although rare, almost always result in death. All information traveling between our brains and our spinal cord, passes through the brain stem. So a brain stem stroke often presents more like a spinal cord injury – for now I was classified as a quadriplegic. The brain stem also contains nerves involved in facial movements, talking and swallowing. So during the angiogram, the clot was cleared from the left vertebral artery, restoring blood flow. The clot in my right vertebral artery was not touched – the artery was damaged and might bleed. 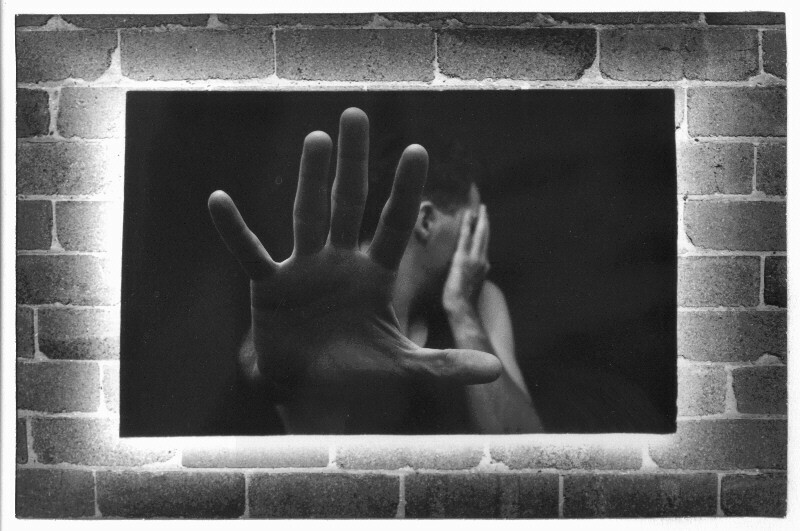 So for now I was locked-in – cognitively aware, but in effect trapped within a very broken body. ← Stroke Day – What’s Happening To Me? Feels silly to hit the like button, but I just wanted to indicate that I had read this blog. Processing processing. Through Katische’s facebook post I signed up to your blog. The rawness of your experience is both touching and scary from where I sit and my imagination fails me to totally comprehend your journey. This email is to just thank you for sharing. Your strength, courage and determination shines through. Thank you for exposing yourself in this way …. so real, so raw and so honest. Steph I have tears as I read this, among your other entries. I cannot ever imagine what this was like for you, for Steve, the kids, your family. At times like this, we wonder what possible reason the big guy upstairs had in mind when things happen. This blog starts to give me an inkling of your greater purpose – of hope, of meaning, of love and recovery. That book in the future – I think it will achieve all those things. Stephanie, you articulate your experience so incredibly well. How unbelievably full on! Scary scary stuff….